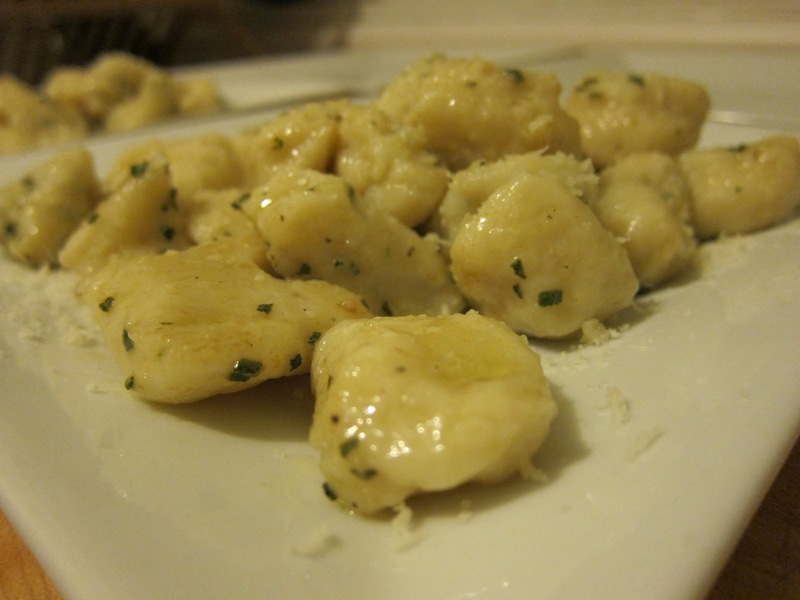 Gluten-free gnocchi – call it nyocci? This is really easy to make and so good you’ll want to make it like this all the time. There are so many ways to serve this pasta-like dish – from simply, with sauteed sage and grated parmesan to rich and complex with sausage, spinach and heavy cream, making it a meal. Enough in this recipe to make several batches and freeze them for future use. Cook potatoes either by baking in the oven (40 minutes at 400 degrees) or microwaving on high 10-20 minutes until done. Or you can steam them whole. Potatoes should be soft and fully cooked inside. Let them cool and peel off the skin and discard. Grate the cooked potatoes or run them through a ricer if you have one, making sure no lumps remain. You should have about 6 C of fluffy potato meal. Add beaten eggs and work into potatoes with your hands or a fork until it forms a ball. Add 1 C and ½ C potato starch. Work in the dry ingredients until you have a dough-like ball, adding more dry ingredients, proportionally, as needed to keep the dough from falling apart. Wrap in plastic and let it rest 20 minutes or longer. At this stage, it will keep several days in the refrigerator. After about 20 minutes, cut the dough in quarters. Set aside three of the quarters. On a lightly rice flour-dusted surface, flatten slightly the remaining quarter with your hand; cut into half or thirds, each piece should be about the size of a plum. Using the palms of your hands, roll each piece until it shaped like a snake. Do this fairly quickly as the less you handle the gnocchi dough, the better it holds together. Repeat with remaining sections, adding small amounts of flour as necessary to keep the dough from sticking. Line up the two-three snakes and cut them into pieces about ½ ro 3/4 inches. To shape the gnocchi, roll them on the tines of a fork, or just cook them without shaping. You should have about 40 gnocchi or four servings. You may repeat with the remaining three quarters and store gnocchi in plastic bags and freeze them for future use, or you can freeze the remaining dough. This entry was posted in Main Courses, Sides, Vegetarian and tagged gluten free, potatoes, rice flour. Bookmark the permalink.